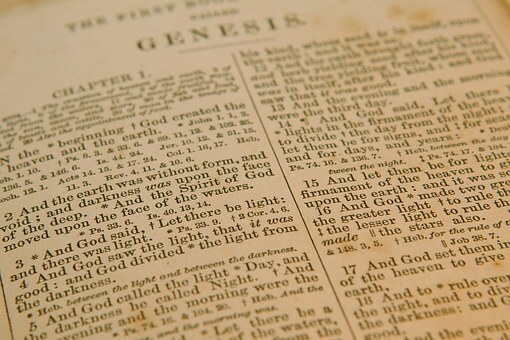 The opening chapters of Genesis are foundational for Jews and Christians. They give us a basic understanding of God, the world, ourselves, and the nature of our relationship to Him. The creation of human beings, male and female, is central to these chapters. In the first, or Priestly, story of creation the account is structured in seven days, indicating the wisdom with which God stills the forces of primeval chaos and shapes the universe. In the first three days, He separates the various elements of the universe—light and darkness, earth and sky, land and sea. Over the next three days, He decorates the world He has made with heavenly luminaries, vegetation, fish and birds, animals, and, finally, human beings. The importance of this last event is underscored by the text itself. For the first time, God deliberates over what He is about to do, taking counsel with Himself: “let us make human beings in our image, after our likeness” (1:26). The Hebrew word for “image” (selem) does not imply a physical resemblance to God, but rather that human beings share in God’s authority over creation. They exercise dominion over the rest of creation over which they have been placed as stewards. In the words of the second story of creation, they are placed in the world to “cultivate and care for it” (Gen 2:15). The next verse (Gen 1:27), in a stunning declaration for the time in which it was written, makes clear that this unique dignity and the vocation to act as priest-stewards applies to women as well as men. In fact, it is only in the duality of both sexes—“male and female”—that the image of God is complete in humanity. In their relation to one another, their communion, they fulfill the role God designed for them in creation. 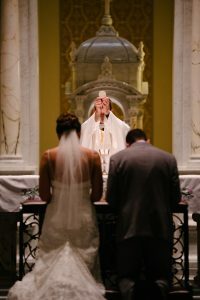 For example, one way in which men and women act as stewards and exercise dominion in creation is through their union in marriage, which allows them to share in God’s capacity to generate human life: “be fertile and multiply; fill the earth and subdue it” (Gen 1:28). The fruitful union of male and female is the basis of the community of the family and of human society as a whole. While the first story of creation describes the creation of male and female in God’s image simultaneously, the second or Yahwist account separates the creation of woman from man, making it a problem which is resolved by the action of God in the narrative. God fashions man (adam) from the clay of the ground (adamah) and breathes the breath of life into his nostrils (Gen 2:7). But in stark contrast to the refrain echoing through the first account in which God saw everything that he had made to be “good” (e.g., Gen 1:25) or “very good” (Gen 1:31), the text sounds a strikingly discordant note: “it is not good for the man to be alone” (Gen 2:18—emphasis added). God’s proposed solution to the problem is to create “a helper suited to him.” While in modern English the term “helper” might carry connotations of being secondary or subordinate to someone else, in ancient Hebrew the word ezer did not. Woman is created as an equal partner to the man and “helps” him achieve his vocation and mission in the world. Like man, woman is made directly by God, and like him she is made for God. Her dignity far surpasses that of the animals, none of whom prove to be the “helper suited” to the man (Gen 2:19–20). Instead she is drawn from the side of the man. St. Thomas Aquinas comments on the fittingness of this: “First, to signify the social union of man and woman, for the woman should neither ‘use authority over man,’ and so she was not made from his head; nor was it right for her to be subject to man’s contempt as his slave, and so she was not made from his feet.” Upon seeing her, the man recognizes himself in a new way, declaring “this one shall be called woman [isha] for out of man [ish] this one has been taken” (Gen 2:23). The point of this play on words is that they are made from the same “stuff” or, more precisely, they possess a common human nature. In addition to describing their equality in spite of their difference, this text specifies the nature of the unity of man and woman in covenantal language. The “deep sleep” that God casts on the man in Hebrew is denoted by the Hebrew word tardemah—the same term used prior to God’s covenant with Abram in Genesis 15:12. God then leads the newly created woman to the man (Gen 2:22), as would the father of the bride in an Israelite wedding ceremony. The man responds with a poem of joy in verse 23, which is also a declaration of his allegiance to her before God. The result of this covenant oath is that the text describes them as “man” and “wife” in Genesis 2:24, highlighting their new unity as “one flesh” with verbs that express covenantal commitment: they “leave” their previous families and “cling” to one another. The covenant of marriage, like the quality and difference of the sexes, is an integral part of God’s plan for humanity from the beginning. John Grabowski is an Associate Professor and the Director of Moral Theology/ Ethics at The Catholic University of America. John and his wife Claire were appointed as a Member Couple to the Pontifical Council for the Family by Pope Benedict XVI in 2009. They have been married since 1985 and are the authors of One Body: A Program of Marriage Preparation and Enrichment for the New Evangelization, now available from Emmaus Road Publishing.